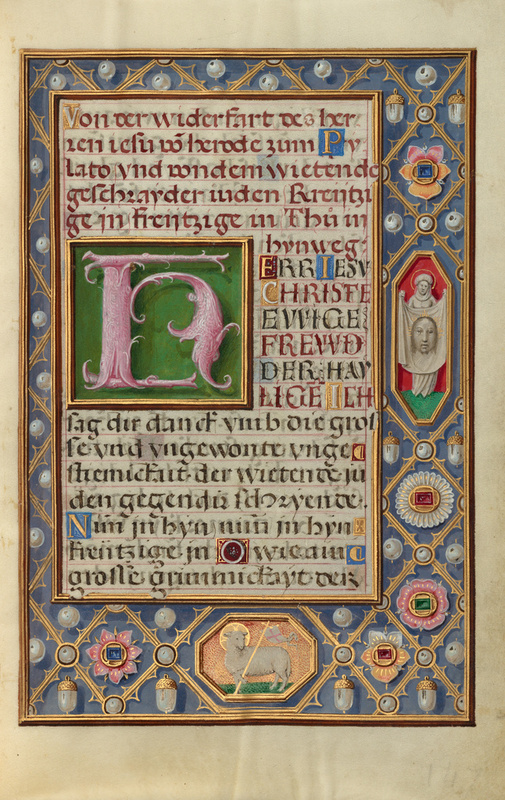 A pattern of pearls and gems set in precious metalwork decorates the border of this text page devoted to the story of Christ being led to Herod. On the right, Veronica holds up her veil with its miraculous image of Christ's face. The image was created when she used the cloth to wipe the sweat from his face as he carried the cross to the site of the Crucifixion. Below, the artist presents the image of Christ as the Lamb of God, a symbol meant to arouse the beholder's sympathy when contrasted with Christ's humiliation in the facing miniature.